Standing 22 feet high,13 feet across and weighing in at 4,685 pounds, the Cassini spacecraft was one of the largest spacecraft ever launched from Earth. A joint project of NASA, the European Space Agency, and Italian Space Agency, Cassini spent 13 years orbiting the ringed planet of Saturn, compiling an enormous amount of data on the solar system’s second-largest planet, its rings and two of its most well-known moons—massive Titan and smaller Enceladus. 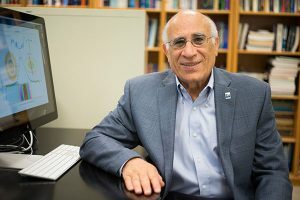 The Cassini orbiter also played a huge role in the career of prominent San José State University academician Dr. Essam Marouf, an Electrical Engineering professor and Associate Dean of Research. He spent 26 years as part of the Cassini Radio Science research team, beginning work on the project six years before it was launched Oct. 15, 1997, from Florida’s Cape Canaveral. He was one of more than 300 science “investigators” from around the world who interpreted data collected by the spacecraft during its 293 orbits of Saturn and transmitted via radio signals. On Sept. 15 — exactly one month short of the 20th anniversary of that launch – Dr. Marouf joined with hundreds of other scientists from around the world who gathered before dawn at NASA’s Jet Propulsion Laboratory in Pasadena to bid their orbiting friend a big, and surprisingly emotional, goodbye. After twice extending the mission that was originally supposed to end in 2008, space agency officials presided over a planned destruction of Cassini in the atmosphere of Saturn, as it burned up like a meteor to avoid contaminating the planet’s moons. After 20 years in space, Cassini was simply running out of fuel. Dr. Marouf likened witnessing the final radio signal from the craft to a death of sorts. It came at 4:55 a.m.
During its two decades of life, Cassini was a wildly successful project. The data collected from gaseous Saturn, its distinctive rings, and its surprising moons have brought a wealth of new information. “The moons turned out to be kind of the stars of the show,” Dr. Marouf said with a chuckle. That’s because of Cassini and its accompanying Huygens lander—which alighted on Titan, Saturn’s largest moon, in 2005—discovered similar conditions to what Earth was like before life evolved. Titan has dry lake beds suggesting the former presence of liquid, but also existing seas consisting of liquid methane and ethane. It was also discovered that icy, frigid Enceladus, the sixth-largest of the ringed planet’s 62 moons, shows evidence of a subterranean ocean comprised of hydrocarbon compounds in liquid form. They erupt to the moon’s surface through geysers spewing ice crystals. Scientists say the discovery of these conditions makes primitive life possible. Helping Dr. Marouf analyze that deluge of information from Cassini has been numerous students, as well as research assistants and associates, over the years. Among them has been Kwok Wong, involved in San José State’s Cassini Radio Science project for 14 years, starting as a grad student taking courses from Dr. Marouf. Wong now is a full-time research associate. “His help with the data processing throughout the years has been significant,” Dr. Marouf said of Wong. For his part, Wong will remain on the Cassini team along with Dr. Marouf for another year. “We will continue to process the data until the Cassini project officially ends next September (2018),” Wong said. This past July, a couple of months before Cassini met its timely end in the atmosphere above Saturn, Dr. Marouf made another trip to Southern California to conduct his final Cassini experiments at the JPL facility, owned by NASA but managed by the California Institute of Technology in Pasadena. The visit was a family affair for the San José State professor. And Cassini was not her father’s first involvement with deep space probes. As a senior research scientist at Stanford for 15 years, Dr. Marouf got involved in data analysis for both the Voyager 1 and 2 missions by NASA launched in 1977. Both did fly-by analysis of the outer solar system —including Jupiter, Saturn, Uranus and Neptune—between 1979 and 1989. “We got so much beautiful data from Voyager’s visit to Jupiter in 1979 and Saturn in 1980,” he said of the predecessors to Cassini. Unlike Cassini, however, the Voyager crafts have still yet to meet their destruction. Voyager 1 is the first spacecraft to leave the sun’s atmosphere and magnetic field, traveling into interstellar space.